Established in 1956, Virgin Islands National Park covers nearly 60% of the island of St. John, over 5,500 acres of adjacent ocean, and the majority of Hassel Island. This vast Caribbean paradise is famous for its scuba diving, snorkeling, and labyrinth of tropical rainforest hiking trails. In the relatively small island of St. John, over 800 subtropical plant species can be found in a wide array of environments like high elevation forests, to mangrove swamps, rich with mangoes, soursops, turpentine trees, wild tamarind, century plants, and sea grapes. In fall of 2017 the Virgin Islands were hit with two category 5 hurricanes that left significant destruction in their wake. On the long road to recovery, there is much work needed to help restore this tropical island paradise to its' former glory. This service trip is to aid in recovery/restoration efforts including helping with the removal of debris and fallen trees, trail maintenance, removing invasive plants, campsite restoration, surveying of archaeologically significant sites, trash pick-up, and possibly native tree planting. 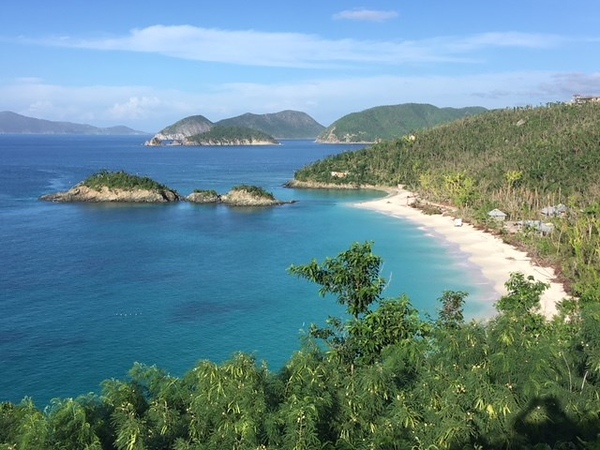 The campground is adjacent to Cinnamon Bay, which is a long, wide stretch of beach on the north shore of St. John. This spot is ideal for relaxing and was named by the New York Times to be one of the 6 Caribbean beaches to see before you die. Be prepared to hike several miles each day, and for warm and humid to cold and wet weather. On our free day we can explore the park and its surroundings, or just enjoy the surrounding beaches.